Elizabeth Hurley and Shane Warne. ELIZABETH Hurley and Shane Warne took their children to Movie World on the Gold Coast. The actress and her nine-year-old son Damian - her child with film producer Steve Bing - joined the cricket legend and his three kids, Brooke, Summer and Jackson, for a day out this week. However, some of the rides were too frightening for Elizabeth so Shane had to go on with the children without. "Rides too scary for me - I had to bury my head in my 9 year old's shoulder ... hope @warne888 recovers from Lethal Weapon & Superman rides. I was too scared; Scooby Doo was enough for me. 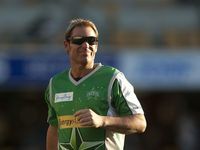 (sic)"
After the family fun day out, the 'Gossip Girl' star and the kids went to watch Shane play a Twenty20 cricket match for his team the Melbourne Stars at the Brisbane Cricket Ground, which is known as The Gabba. Elizabeth - who separated from her husband Arun Nayar in June after four years of marriage - tweeted: "At the Gabba (who'd have thought I'd have ever written that) and loving it. With 4 over excited children. (sic)"